You’re sure to cause a stir at this years Christmas function with these amazing office party dresses. Many of us spend the year having to adhere to certain workday clothing guidelines. The office party, however, is one day of the year you have the opportunity to dress completely differently. Use it to show your colleagues your fabulous sense of evening style. Our edit is brimming with a stunning selection of dresses that are absolutely ideal for such an occasion. Velvet is a perfect fabric to opt for when choosing office party dresses. Its soft, luxurious texture will shape your figure beautifully. It’s also warm and incredibly beautiful to look at. Just like the lace inset burgundy dress by Harlyn. The stunning lace insert on the bodice provides a stunning centre piece for this luxurious dress. The lace travels upward to create dual shoulder straps and a beautiful scalloped lace V-neckline. 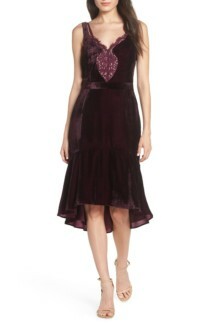 The rest of the dress is constructed in a gorgeous burgundy velvet with a defined waist and pretty flounced hemline. You’ll be hard pressed to find a more perfect party dress than this black velvet dress by Topshop. This sweet mini dress is adorned with multi-hued crystals that sparkle beautifully under the light. The deep V-neckline and asymmetrical ruffle on the skirt creates a wonderfully flattering wrap effect. This dress also provides a daring finishing touch in the shape of an open back. This is perfect party wear for the upcoming holiday season. Depending on your line of work, you may require a certain style for your office party dress. 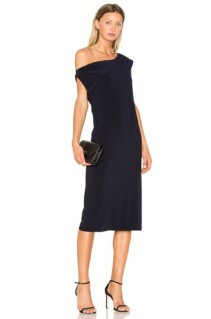 In this case, a midi hemline is always a favourable option. It creates a wonderfully chic silhouette that maintains a certain sense of professionalism without compromising on style. For this occasion, we cannot recommend the lace black midi dress by Chi Chi London highly enough. The elegant lace bodice with a high neckline and cinched waist also has padded cups to create the perfect silhouette. The fit and flare design transitions elegantly to the stunning, voluminous tulle skirt. Simply adds heels and style your hair in a simple up-do to subtly compliment this beautiful dress. Stay on trend with the high neck zebra print dress by Asos Design. This classically cut dress offers a timeless sense of style which combined with an animal print gives a contemporary edge. The cinched waist is amazingly flattering whilst the tie cuffs and split leg add stylish additions to this beautiful dress.